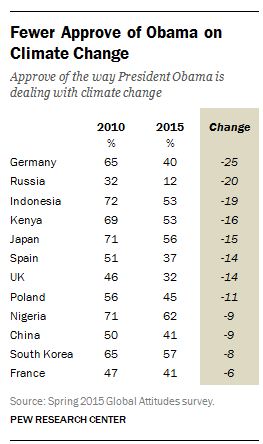 1Globally, Obama’s image is mostly positive. 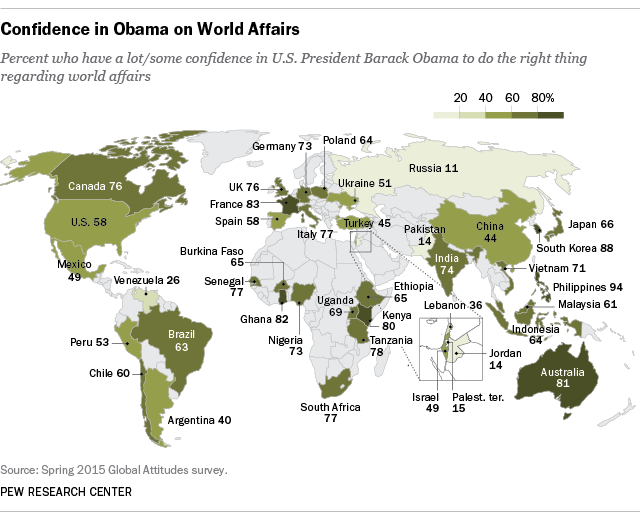 Across the 40 countries polled, a median of 65% say they have confidence in Obama to do the right thing in world affairs. A median of just 27% lack confidence in the American leader. Overall, Obama remains much more popular globally than his predecessor, but opinions vary significantly across nations and regions. 2 After a difficult year in U.S.-Israeli relations, Obama’s ratings have fallen sharply in Israel. Today, just 49% of Israelis express confidence in him, down from 71% last year. Obama has had strong, and well-publicized, disagreements with Israeli Prime Minister Benjamin Netanyahu over negotiations with Iran, and Obama’s ratings are especially low among Israelis who identify with Netanyahu’s Likud Party (40% have confidence). Overall, eight-in-ten Israelis disapprove of how Obama is dealing with the issue of Iran’s nuclear program. 3 However, the harshest assessments of Obama are found in an increasingly anti-American Russia. Only 11% of Russians express confidence in the U.S. president. Obama has never been very popular in Russia, but 29% did voice confidence in him two years ago, before the outbreak of violence in Ukraine. Nine-in-ten Russians disapprove of how Obama is handling the Ukraine crisis. The percentage of Russians with a favorable view of the U.S. has also declined sharply over the past two years, dropping from 51% in 2013 to 15% this spring. 4 The president’s trip to India may have helped his image there. 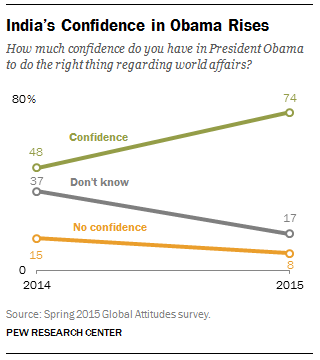 About three-in-four Indians express confidence in Obama, up from 48% in 2014. It’s been a year of high-profile visits in the U.S.-India relationship. Indian Prime Minister Narendra Modi visited the U.S. last September, and Obama traveled to India in January. The trip seems to have increased Indians’ familiarity with the American president – the share of the public with no opinion about Obama dropped from 37% last year to 17% today. 5 Obama is very popular in Africa (and so was George W. Bush). Obama’s ratings in sub-Saharan Africa are overwhelmingly positive. This year, we surveyed nine countries in the region, and big majorities in each nation express confidence in the American leader. Of course, his predecessor was also largely popular in the region; the rise in anti-Americanism that occurred in many parts of the world during the Bush era was largely absent in Africa. 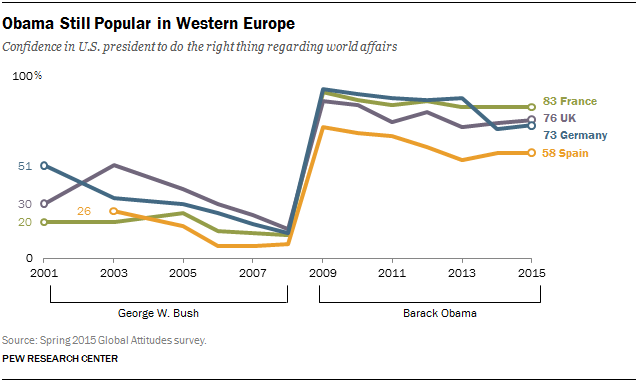 6Western Europeans are still big Obama fans. Even as a presidential candidate, Obama was popular among Europeans, famously addressing a large crowd in Berlin in July 2008. When Obama entered the White House, his ratings were extremely high, and they’ve only slipped a little since then. At least a majority has confidence in him in each Western European country surveyed. Still, there is disappointment with Obama in the region on certain issues, such as climate change. 7 Obama’s ratings on climate change have slipped. When he was elected, expectations were high for Obama on the issue of global climate change. Overall, he still gets positive ratings for how he is handling this issue, but not as positive as a few years ago. In 12 of the 20 countries where trends from 2010 are available, fewer people now approve of how he is dealing with climate change, which will be a major issue on the international agenda as nations prepare for a major global summit on climate change in Paris in December. For more about how the world views the U.S. and President Obama, see our new report, and click through our Global Indicators database.